I came across this dock and using it for past two months. It turn out to be very usable cook looking dock for me. 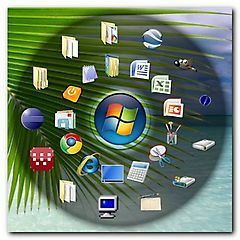 In Windows XP and Vista, you can hide all Desktop Icons in 3 mouse clicks. You can show the icons in same 3 clicks. Right click on your desktop, select “Arrange Icons By” and select “Show desktop Icons” to hide (and show it later). How to install unsigned driver (if you have to) in Windows 10?